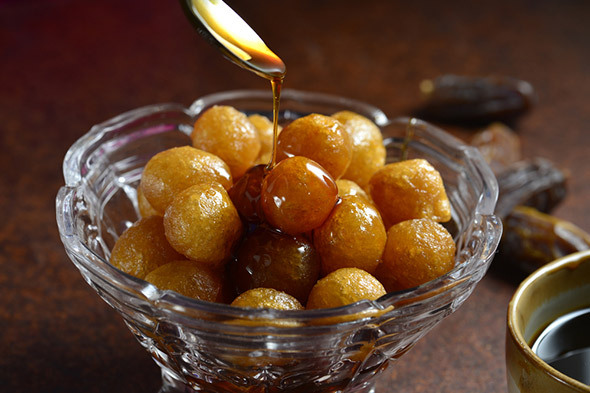 Dates – the dried yet succulent morsels of amber-brown deliciousness that, at the same time, are healthy and satisfy our craving for sweetness – are the fruit of a tree known as the date palm. Dates are among the oldest cultivated fruits in the world, first thriving in the Middle East and now grown all over the globe. There are over 2,000 varieties of dates, but the medjool date is the most common type of dates grown in the United States. The name “date” is derived from the Greek word daktylos, which means finger, probably because dates are more or less shaped like the fingers of the hand. In the Middle East and Northern Africa, dates have been grown for thousands of years as a profitable agricultural product. (The date palm is the national symbol of both Israel and Saudi Arabia.) Date palms are found in abundance in the desert (one of the few crops that grow in such arid, hot, and challenging conditions) and many parts of the Middle East would be uninhabitable were it not for this type of tree. The date palm trees that provide dates require very high temperatures for at least 100 days to produce top-quality fruit. The trees grow very large, produce fruit for a long time, and can survive long droughts and temperatures that regularly top 100 degrees F. Despite these conditions, more than 3% of the farmland in the world is used to cultivate date palms that produce 4 million tons of fruit every year. Growing dates requires patience and fortitude as date palms can take up to eight years after planting to bear fruit, and at least 10 years to start producing yields for commercial harvest. One tree can produce between 150 to 300 pounds of dates per season. There are more than 200 kinds of dates, although only 20 or so are commercially viable. 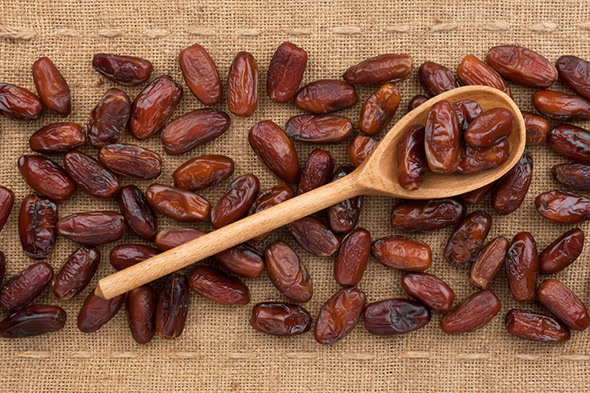 The major date producers are Egypt, Iraq, Iran, and Saudi Arabia. The first date trees were imported to the United States from Algeria in 1900; today, the center of the date industry in the United States – which is one of the top-20 producers of dates in the world (albeit near the bottom of the list) – is Indio, California, not far from Los Angeles. Dates, which are eaten in their dried form, have a very low water level, which leads to the fruit’s long shelf life of several months. They also have a high sugar level, making them nature’s candy, but a fruit to avoid if one is counting calories. 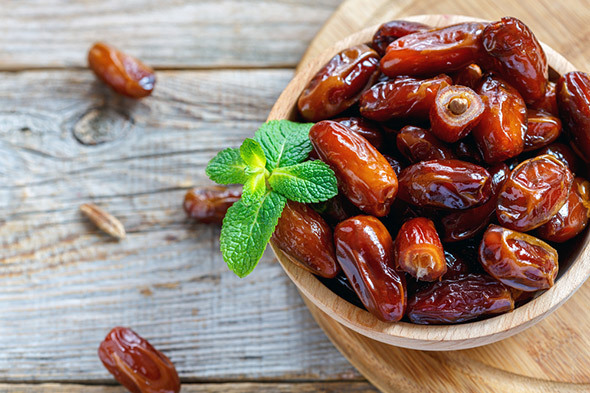 Dates can be used in dessert recipes, protein shakes, and in savory, Mid-East-type meat dishes. The pit can be removed and replaced with cream cheese or nuts for a snack. The sweet fruit is also loaded with vitamins, minerals, and healthy fiber. Honey-like date syrup is made by mashing fresh dates to a pulp and straining the mash through cheesecloth (more on this later). The most beneficial aspect of dates is that they are enriched with dietary fiber that is vital for maintaining and improving digestion and colon health. In addition, the fruit contains a significant amount of minerals, such as selenium, magnesium, copper, and manganese, which strengthen bones and fight diseases including osteoporosis. Magnesium is also helpful in lowering blood pressure. High levels of iron in dates make them an excellent dietary supplement, in particular for those who suffer from anemia. In addition, the fruit is a very a good source of potassium, which helps reduce the risk of stroke and other heart-related disorders. With the rise in popularity of diets that shun sugar and emphasize fruits, vegetables, and grains, people around the world are searching for healthier sugar-alternatives. Date syrup, a thick, caramel-colored sweetener made from dates, is a naturally sweet alternative to honey, which can also be used by vegans (who don’t use the bee-produced nectar). Although date syrup is easily available in health food stores, it is just as easy to make at home (and the homemade version is more economical than the store-bought product). Medjool dates are ideal for making date syrup. Deglet Noor dates work well too, although they need to be soaked for longer after boiling to soften. Date syrup is made by boiling chopped dates, puréeing the cooked dates and squeezing out their liquid, leaving behind a thick paste you can save for other uses. After straining, the date liquid is thinner than maple syrup but flavorful, nonetheless. However, most people prefer to cook the thin liquid to a thick honey-like consistency, not just for more flavor, but also because the reduced water content makes the syrup better for baking. Date syrup can be stored in the refrigerator for several weeks. Use it where you might use maple syrup or honey — on warm pancakes, waffles, or oatmeal. Add it to smoothies for sweetening. It is also delicious in coffee where the caramel flavor really stands out and improves the drink. For baking, you need to use less date syrup when replacing granulated sugar —a ratio of about 2/3 cup date syrup for every 1 cup of sugar — and less liquid in the recipe. Or just replace honey, maple syrup, or molasses with date syrup in baking for a more caramel-like flavor. Coat the blades of kitchen shears with a thin layer of oil, and use the shears to finely “chop” the dates. Place the dates and water in a medium saucepan and bring to a simmer over medium heat. Simmer for 30 minutes, stirring occasionally. Remove from the heat and cool for 30 minutes. Transfer the mixture to a blender or food processor fitted with the blade attachment and blend until very smooth, at least 1 minute. Line a fine-mesh strainer with 2 layers of cheesecloth. Pour the date purée through. Once all the pulp is in the strainer, pull the sides of the cheesecloth together and twist to press out as much syrup as possible. To thicken, return the syrup to a medium saucepan and simmer over medium heat for 30 minutes. Remove from the heat and cool before storing. Date syrup can be stored in an airtight container in the refrigerator for a few weeks. Biting into the juicy sweetness of the date’s flesh is one of life’s great pleasures. Considered the “fruits of paradise” in Islamic tradition, dates are versatile and healthful, and they can be used for everything from cakes and cookies to heavier meat-based main dishes. Date syrup is a great alternative to honey or maple syrup and it is showing up frequently in shakes and smoothies, and over ice cream and pancakes. Embrace the date – it’s time has come! This entry was posted in Cooking Tips, Food Guides, Health and Safety, Recipes and tagged dates, fruit, healthy, recipes. Bookmark the permalink.